I have 25 years of experience working in and behind the scenes in the entertainment industry as an entertainer, producing shows and working in booking agencies. Whether you are having a small private party or a major event, a wedding, corporate function, birthday, cocktail party, dance party, club/public event or private event, I can make your event a successful one! The right entertainment can make your event something special and be the talking point for guests well after the event. In addition to the entertainment options listed on these pages I can tailor something to your occasion. Please don’t hesitate to call me to discuss your requirements. Just when you thought the seventies were safely behind you and mirror balls and platform shoes were a thing of the past THE sensational the seventies sirens the GIRLS OF ABBA are back! 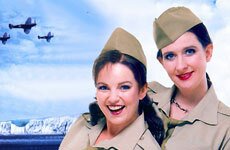 Recreate the magic of the forties with all the old wartime and swing favourites. Lisa has worked for many years presenting her own solo shows on the club cabaret circuit performing with top Australian and Overseas variety acts. Chemistry is guaranteed to set your event on fire! This high-energy band will guarantee a chain reaction of non-stop dancing with hit after hit from the rock’n'roll sixties, seventies disco, back to school eighties, classic funk, nineties through to modern day club anthems.